I love my interactive whiteboard. I have a Smartboard that I use daily for any number of things from interactive lessons to the projection capabilities. I teach a lot of small groups though, and one aggravation is having to stand up near the Smartboard to manipulate the screen when my small group is sitting at a kidney table. Enter the app Splashtop. Splashtop 2 – Remote Desktop is an app that allows you to control your computer remotely from your iPad. The first time I saw this in use was at a conference where the presenter was using it to flip through her presentation while also switching from website to website to illustrate different points. It mimics your desktop allowing you to manipulate anything that you normally access…including your Smartboard software. Brilliant. 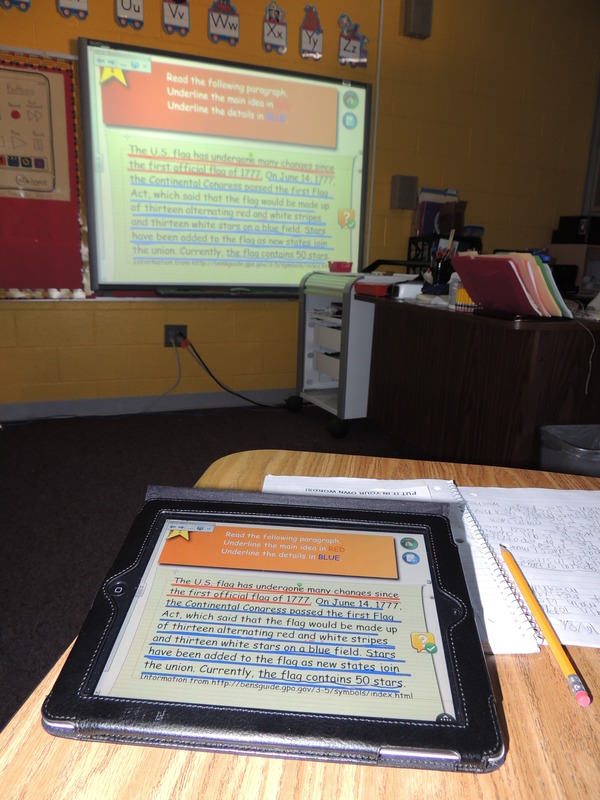 We used the Splashtop app to highlight the main idea and details in a Smartboard lesson. I use this app by setting up my iPad on the table and connecting to my laptop remotely through our wireless connection. From my laptop, I can now sit at the table with my small group of students and type or manipulate my Smartboard with the students. This has been particularly useful when we are note-making. The kids can generate ideas and I type them into the iPad at the table for the whole group to see. All of the regular features of the Smartboard still work, so students can go up to the board and manipulate it. The beauty is that I can remain where I can see my student’s independent work while still using the Smartboard effectively. I’ve found it’s easiest to manipulate the small buttons using a stylus. Typing is not problem, as the regular iPad keyboard comes up, it’s just easier to choose files using the precision of a stylus. Keep in mind, your entire desktop is displayed on your iPad screen. Additionally, while most of the apps I use are free, this is one of the few I’ve actually bought. However, I find it well worth the money.